The blaze is 60 percent contained but could grow into the state's biggest wildfire ever. LOS ANGELES — After a welcome lull in powerful winds that drove Southern California’s massive wildfire, crews and homeowners were bracing Wednesday braced for the return of potentially dangerous gusts that could revive the flames. Some residents are watching from afar at hotels and evacuation centers, while others are waiting in their homes and hoping for the best. 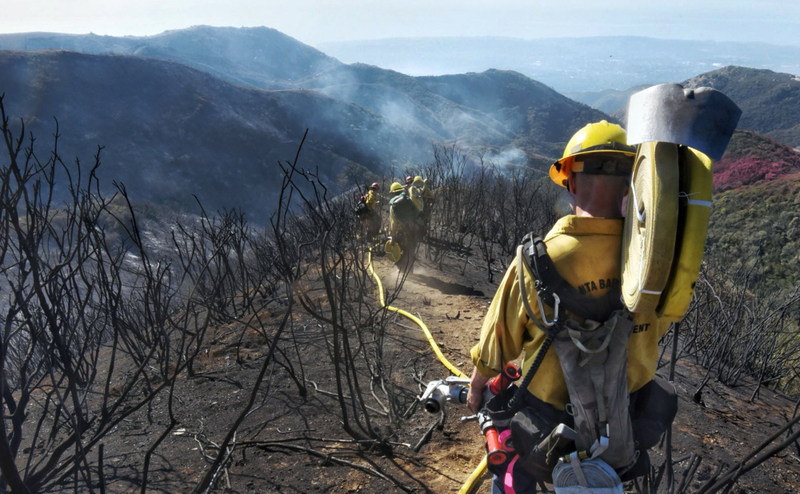 Mike Eliason/Santa Barbara County Fire Department via AP Firefighters work along steep terrain to root out and extinguish smoldering hot spots in Santa Barbara, Calif., on Tuesday. Communities remain threatened in Ventura and Santa Barbara counties. Firefighters used two days of calm conditions to build containment lines and set controlled fires to clear dry brush ahead of incoming sundowner winds. The blaze that’s burned is 60 percent contained and now the second-largest in California history. Officials said the new winds could cause it to grow into the state’s biggest fire ever. As of Tuesday, 432 people were still staying at evacuation shelters run by the Red Cross.